These blooming tea flowers turn tea time into a mesmerizing ritual. The blossoms open slowly inside the glass pot, and they’re infused with Chinese tea that delivers delicious fragrance and flavor. Each flower is good for about three infusions. 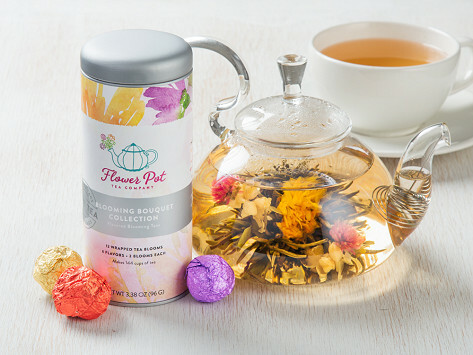 This set includes a beautiful glass teapot with a wire filter and a collectible tin with a dozen wrapped tea blooms, two of each delicious flavor. Teapot capacity: 27 fl. oz. Dimensions: Teapot: 6.8" x 6.8" x 6.5"; Tea Bloom Tin: 2.8" x 2.8" x 6.1"
Weight: Teapot: 1.05 lbs. ; Tin: 0.38 lb. Brilliant Berry: Pops with intense flavor, finishing with earthy tones of white tea and a delicate floral bouquet. Coconut Escape: Glows with exotic nuttiness, balanced by herbal notes of white tea and mellow floral nectar. Lush Lavender: Relieves tension and anxiety with soothing aromas to cleanse the mind and the well-rounded earthiness of refreshing white tea. Powerful Pomegranate: Shines with tart juiciness, finishing with delicate notes of white tea and a subtle floral sweetness. Regal Jasmine: Blushes with calming aromas, rounded out by herbaceous notes of white tea and delicate sweet nectar. Summer Peach: Brimming with juicy nectar, grounded by mellow notes of white tea and elegant floral sweetness. I purchased this for my daughter's birthday. She collects teapots and is a big tea drinker. It was a hit...she loved it! Bought as a gift for someone. It is lovely and I am now going to purchase for myself also. My daughter-in-law loves this gift and was quite excited upon opening it at christmastime. Fast delivery, looks as pictured, love! Fast delivery, looks like the picture, saving to have out at Christmas. A gift—for me! Transform tea time into a mesmerizing display with these blooming flower teas and tisanes. Both are real flowers. The blooming teas put on a beautiful show, opening slowly while they steep and deliver delicious flavor and fragrance. The tisanes are actual dried flowers that add a unique floral taste to the brew. 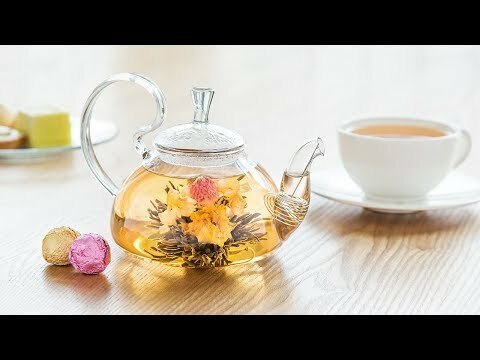 To showcase the flowers’ beauty as you enjoy its taste, Flower Pot Tea is meant to be served in glass. Each kit guides you with instructions, time estimates, and the number of infusions (or the lifetime) of each flower. The blooming teas and all of the tea flowers are sourced directly from different regions in China. And each tea is unique. The Lotus Tisane, for example, gathered from a monastery on one of China’s holy mountains, has a golden honey aroma that evolves into a subtle herbal fragrance. Whether you’re hosting friends or serving yourself a cup, these fragrant flowers entertain the senses.